➥ WHAT DO PEOPLE THINK ABOUT Pack Of America INDUSTRIAL STRETCH FILM? It ensures safe & secure delivery of packages. This stretch wrap is made in Europe that has a high quality and durable film with 80-gauge thickness to protect your product better while giving you the benefit of using less film. Constructed with high performance and environmentally sensitive hand-film for maximum unitization. Specially made for industrial, professional and commercial use, this tear-resistant product is made for heavier loads and pallets with protruding edges. Ideal for all your packing, moving, shipping, traveling and storage needs at home, warehouses and more places which need wrapping or packing tools. ✓ Fba Sellers, Warehouses, Supermarkets. ✓ Shipping, Moving, Manufacturing Companies. ✓ Retailers, Freight Forwarders, Distributors. Go ahead and Add to Cart now before the offer expires!  OUTSTANDING INDUSTRIAL PACKING FILM - Looking for strong HIGH-QUALITY packing film that does its job? You are in the right place. 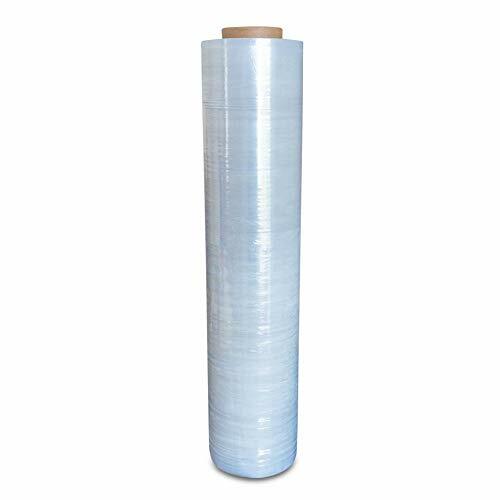 Our Packing Film is made of the finest materials to tolerate more and be 100% reliable for your needs. Try it now RISK-FREE with our Money Back Guarantee. The product measures 18" x 1100 Foot, 2" Core, 80 Gauge, 1 Pack/Roll.  PERFECT FOR WRAPPING PALLETS, CARTONS & FURNITURE - Do you work in a warehouse or maybe you are just moving to a new house? In both ways, our Packing Film can be useful to you. Our thick Packing Film keeps your goods safe during transit. Perfect to protect your heavy duty items, cartons, boxes, pallets, bed, couch, tables and other furniture.  #1 PROTECTION DURING TRANSIT - Anything you are more careful about shall be protected so it is safe from dust, water, damage etc. during transit. Our film is your best sturdy solution for all your packing, shipping, moving, storing needs. The Film keeps your goods more stable and safe when it is being shipped in containers, cars or trucks etc.  AN EFFICIENT TOOL FOR COMPANIES AND HUGE BUSINESSES - Searching for helping hand that pack and wrap small items, box, pallets and big shipments safely and securely? Keep your eyes here our stretchable plastic film is the perfect tool for every retailer, distributor, manufacturer, wholesaler, Amazon Fba seller, forwarder and other packing, shipping and moving companies and great for warehouses, supermarkets and distribution centers too. If you have any questions about this product by Pack of America, contact us by completing and submitting the form below. If you are looking for a specif part number, please include it with your message.